So far Breanna Castro has created 122 blog entries. 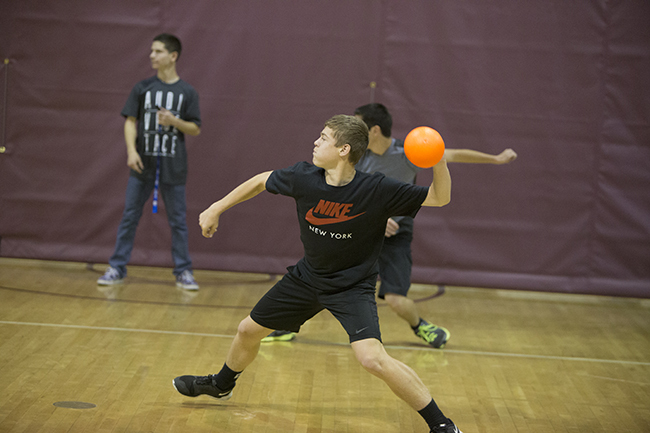 Sophomore Jacob Bynum serves up in attack mode during Intramural dodgeball, March 20. Sophomore Jacob Bynum winds up and prepares to go on the offensive, March 20. FC leadership put on an Intramural dodgeball tournament during lunch for students to have a friendly competition between each other. For more photos, visit Gold crown and Elementary track and field. 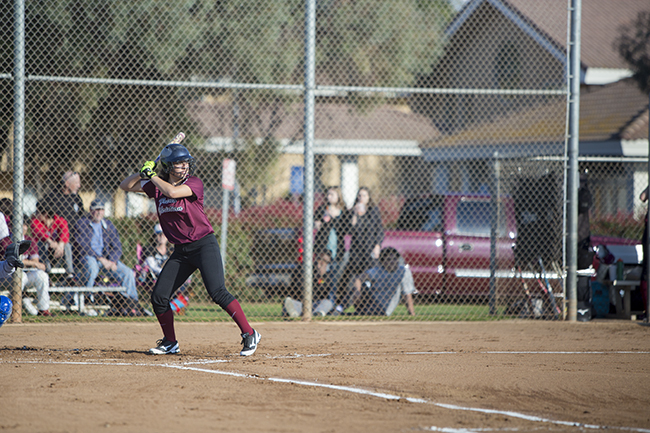 Both softball and tennis are in action against Firebaugh this week. Come watch Gabriela Siqueiros, ’15, and the Lady Eagles play against Firebaugh, March 19. It’s game day FC! Gabriela Siqueiros, ’15, and the Lady Eagles are gearing up to play this week against Firebaugh. 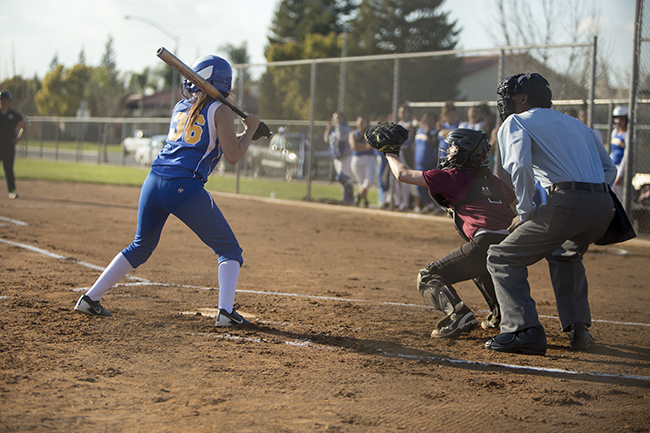 Softball has a home game at 3:30 p.m. Tennis also has a match in Firebaugh a 3:30 p.m. Go support your Eagles, March 19. For more photos, visit Feather on the east coast and Parking lot safety. 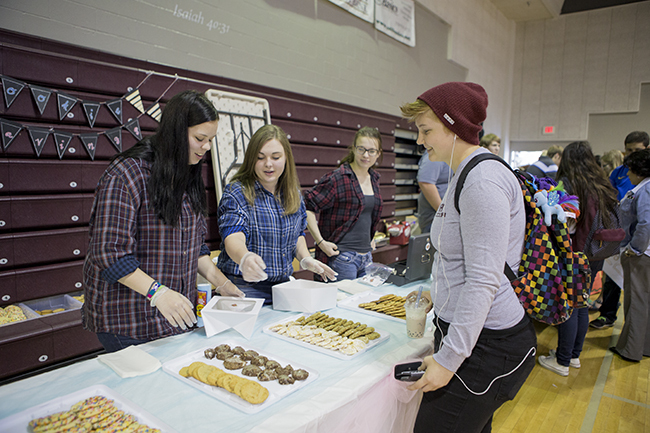 Economics classes test and sample their fellow classmates’ products for the upcoming Econ Fair, March 18. The economics class has been working on creating their own mini business to show off at the Econ Fair in the FC gym, March 18. The whole point of the Econ Fair is to teach students about budgeting, promoting a new idea and following through on their plan. For more photos, visit Worship time and Dodgeball Tourney. Follow The Feather via Twitter @thefeather, Instagram @thefeatheronline and Facebook @thefeatheronline. Sophomore Roy Brown works with fellow classmate Matthew Tanaka as they edit their upcoming NOTS movie, March 28. The sophomore class works on their interpretation of the movie Kicking and Screaming for NOTS. The different class movies will be shown at Night of the Stars, March 28. Tickets are still available for purchase in the office for $60. For more photos, visit Hotel Edison and Econ fair today. Follow The Feather via Twitter @thefeather, Instagram @thefeatheronline and Facebook @thefeatheronline. Ashely Garcia, ’15, prepares to catch the ball to strike out the batter. All FC sports have away games, March 13. 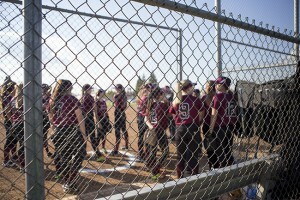 HS softball and baseball is at Kings Christian High School, 3:30 p.m. and HS track is at Coalinga High School, 2 p.m. For more photos, visit Auction time and International Drone Day. 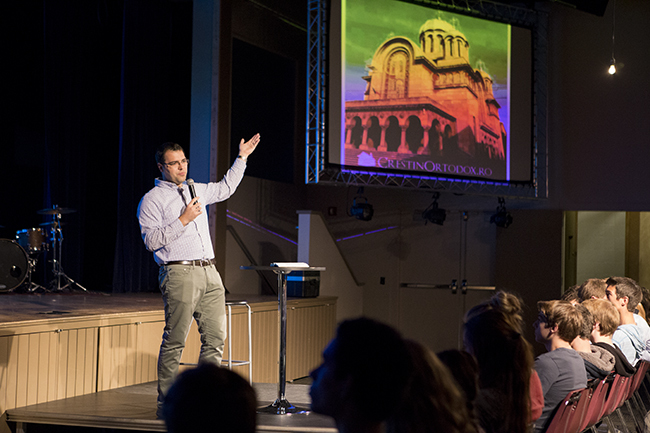 Andrei Sava spoke during chapel on his life in Romania, March 12. 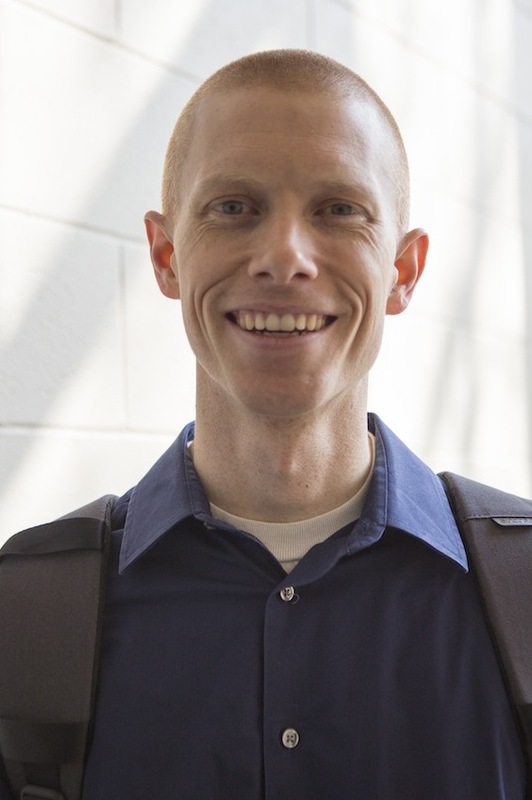 Sava is the Director of 5th- 8th Grade Ministries at Trinity Community Church. Before moving to the United States he lived in Romania, while living there he was introduced to the Eastern Orthodox Church. He explained that it is different from Christianity. They do not have the same goals in mind and they do not believe Jesus is the way to get to heaven. For more photos, visit International Drone Day and Meet and Greet . 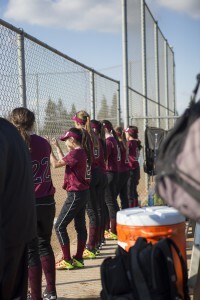 Girls line up in batting order awaiting their turn to be up to bat, March 3. There will be a softball game at Sierra High School at 3:30 p.m. March 11. Go support your Eagles at their first away game. Update March 11, the game has been canceled. The scheduled date is unknown. For more photos, visit Civil rights photojournalist and Alive. 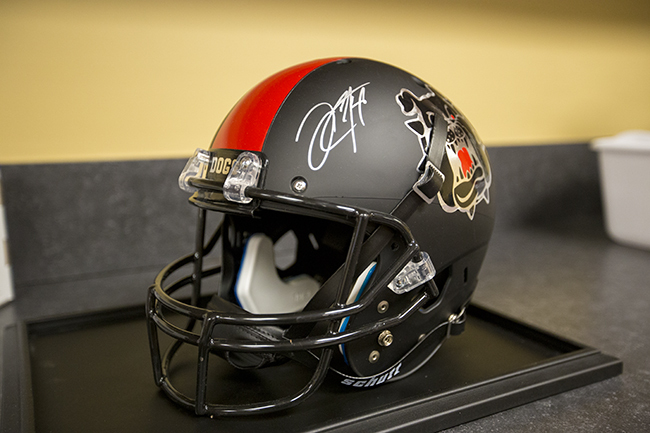 Derek Carr, former Fresno State quarterback autographed this exclusive blackout helmet. This helmet and a Raider helmet signed by Carr, will be sold at the 32nd annual FCS auction. The auction will begin at 5:30 p.m. March 14. For information on the auction, visit FCS 32nd annual auction is March 14. For more photos, visit Career Day and Armenian Centennial Dance. Andrew Guthrie was nominated by Susan Ainley and Lesley Bannister in Disney’s “When You Wish” award for outstanding music performance and contribution to the school community. 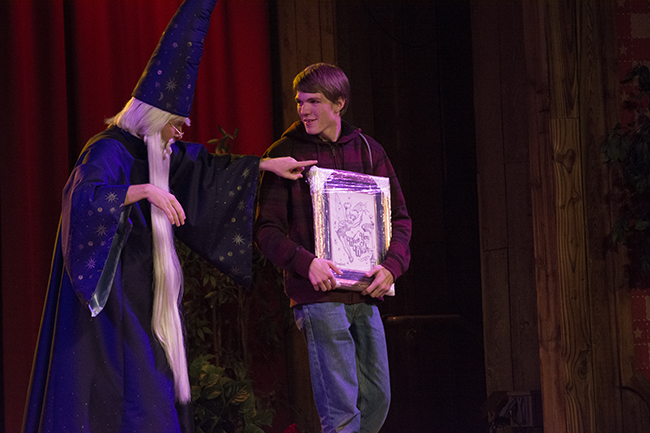 Andrew received this award at Worldstrides Heritage Music Festival in Disneyland, March 6-7. 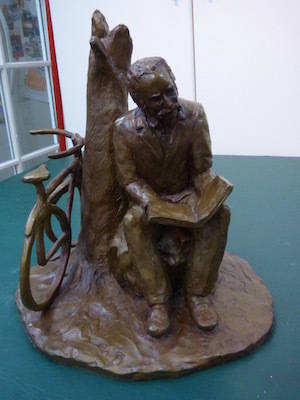 Guthrie was only one given the award at this festival. There are only 13 total for the entire 2015 festival season. Andrew Guthrie and Ivette Ibarra were given the Maestro award for their solos during performance. For more info, visit Heritage Sweepstakes winners. For more photos, visit Heritage Sweepstakes winners and Daylight savings time. 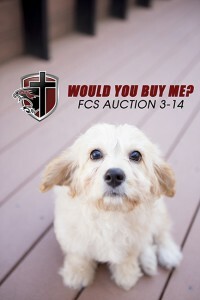 FCS is having their 32nd annual auction March 14. There will be a silent and live auction; dinner, dessert and raffle tickets will be sold all night. The puppy above is a Cavachon; a combination of Bichon Frise and Cavalier King Charles Spaniel. She is 11 weeks old, lovable, playful and donated by Don Wright Insurance Agency. She has been to the vet at Palm Bluffs Veterinary Hospital and is up to date on all her shots. The FCS auction will begin at 5:30 p.m.
For informtion on the auction, visit FCS 32nd annual auction is March 14. For more photos, visit Double header tomorrow and Golf. The Medieval knights prepared their horses for battle, March 5. 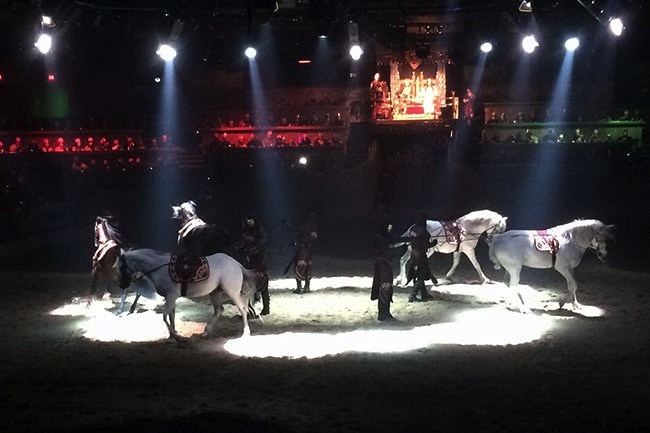 HS ensemble, band, jazz band, JH band and Kevin Garcha, ’16, went to Medieval Times in Buena Park. Their groups were able to enjoy a dinner and show while they learned about the Medieval times. The groups will to perform for #Heritage2015 on March 7. For more photos, visit Golf and Nots asking continues. Softball huddled up and discussed the game strategy. There will be a home softball game against Stone Ridge Christian at 3:30 and an all day tennis tournament at Fresno City College, March, 6. Baseball will have a double header home game verses Stone Ridge Christian at 10 a.m. and 1p.m. There will be a track meet at Fowler against the Redcat Relays at 9 a.m. March. 7. For more photos, visit Nots asking continues and Jesus’s final words. 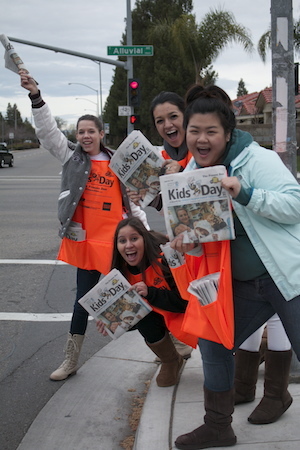 The madness of Kid’s day is approaching FC, March 3. Fresno Christian will be selling at the corners of Maple and Alluvial and the corners of Alluvial and Cedar. Leadership has to be at their corners at 4 a.m. and the Feather staff has to be at the corners by 5 a.m.
For more photos, visit Boys basketball is in playoffs and We love our grass. Juniors, Vanessa Shubin, left, and Marisa Jonigian presented their prototype for the Econ Fair in front of the class, Feb. 26. 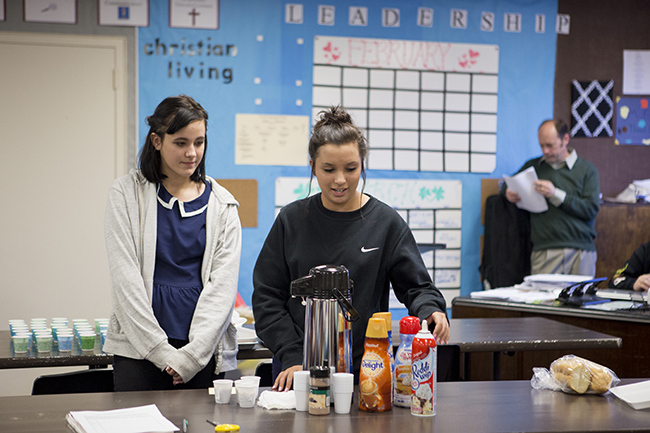 In Robert Foshee’s 6th period economics class his students created original ideas such as foods, drinks or knick knacks to sell at the Econ Fair. For more photos, visit Varsity is going on the road and Teacher luncheon. 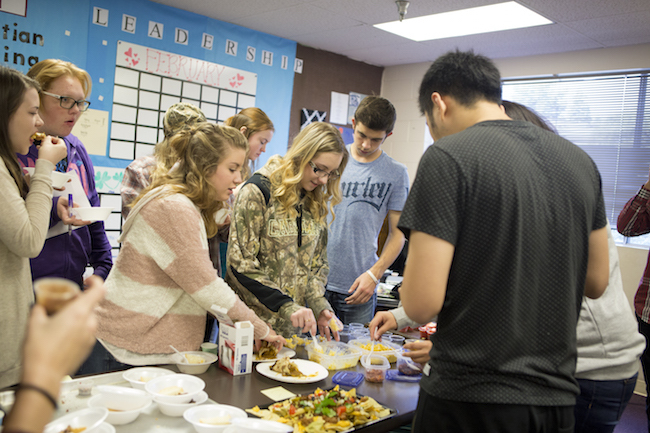 California Scholarship Federation (CSF) students put on a luncheon for the teachers, Feb. 26. 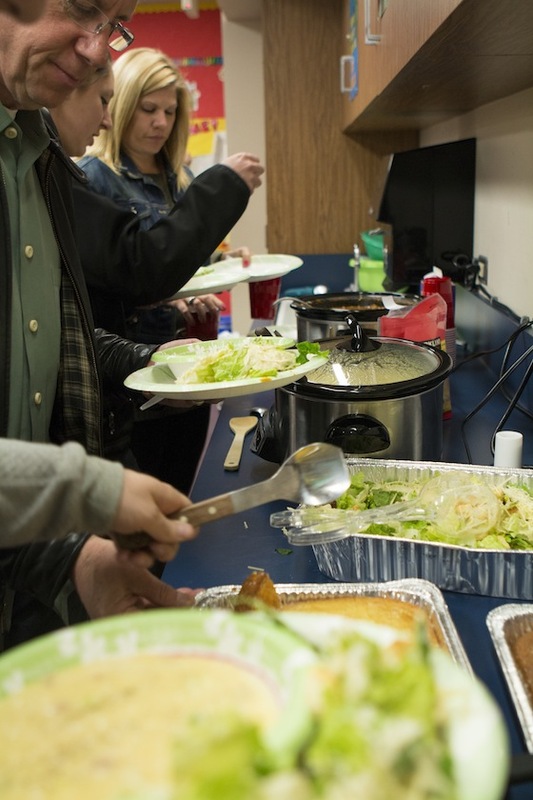 Students brought food and welcomed all teachers to gather in room 603 for their lunch hour. Almost all teacher attended and agreed the chili was a hit. For more photos, visit Football chapel and Brother to Brother. No. 9 Olivia Messer, ’18, tries her shot at goal during the Division VI Valley Championship game against Frazer Mountain, Feb. 24. The Eagles were defeated by Frazer, 2-0. 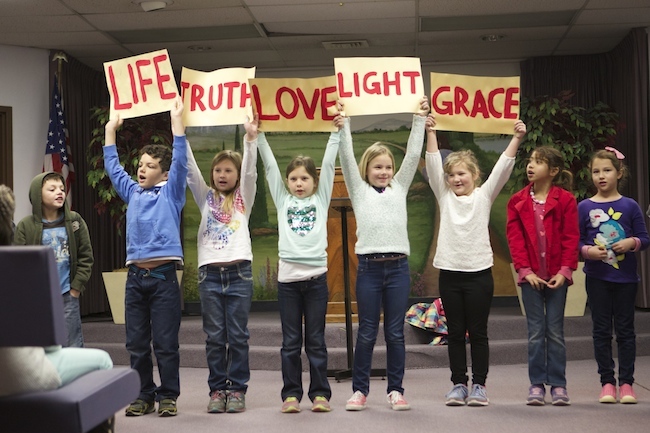 Kristin Nolte’s second grade class sang Words, by Hawk Nelson and Speak Life, by Toby Mac in elementary chapel, Feb. 24. Young students sang with joy and were interactive with their audience. During the song Words, students held up positive words on posters; and as they sang Speak Life, they broke off and passed out posted notes with encouraging messages. For more photos, visit Winter sports banquet and Scholastic Journalism Week. 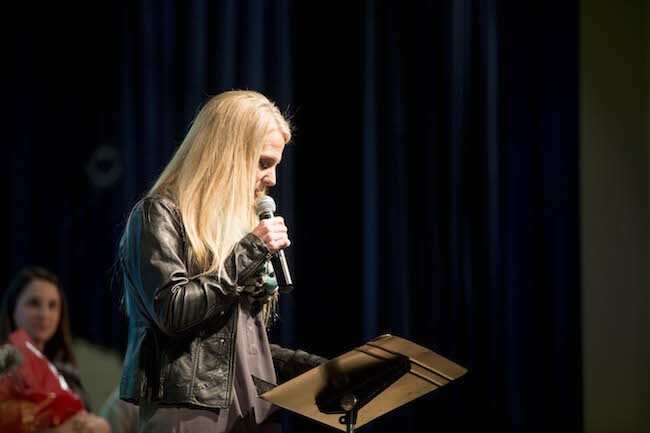 Alumni Katie Mendenhall, ’93, announced the new Eunie McEntee Cheer Scholarship at the winter sports award banquet, Feb. 23. The scholarship will go to a deserving cheerleader every year to help lighten the load. The scholarship is to honor all of McEntee hard work throughout the 25 years of her service here at FC. For more info on McEntee, visit Previous cheer coach offers scholarship to deserving athlete. For more photos, visit “Science Rules” and Involving the whole school. Editors Rees Roggenstein, ’16, left, and Chloe Mueller, ’16, talked to the campus students during tuesday chapel about Scholastic Journalism Week, Feb. 24. Roggenstein talked about the many ways you can be involved with Journalism, you can write for your newspaper, take pictures, and you can comment on the various articles. 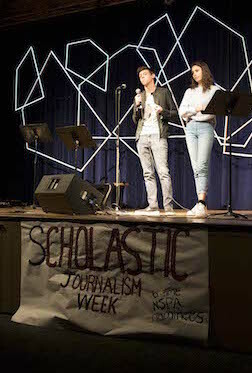 Publication students throughout the nation will be celebrating the art of journalism during Scholastic Journalism Week, Feb. 22-28. For more info on Scholastic Journalism Week, visit National Scholastic Press Association honors Feather. No. 5 Jenna Bynum, ’18, takes the free kick against Riverdale. The girls varsity soccer team beat No. 1 Farmersville in the semi-final playoff game, 2-0, Feb. 19. They will now advance to the Division six Valley Championship game. 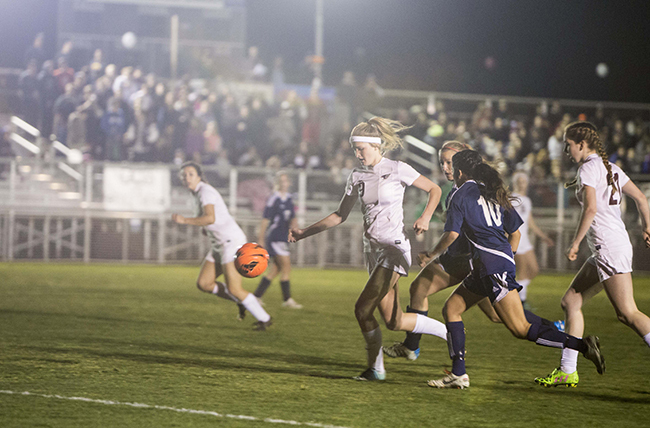 The Valley Championship game will be at 7 p.m. on the FC field, Feb. 24. They will be playing Frazier Mountain. 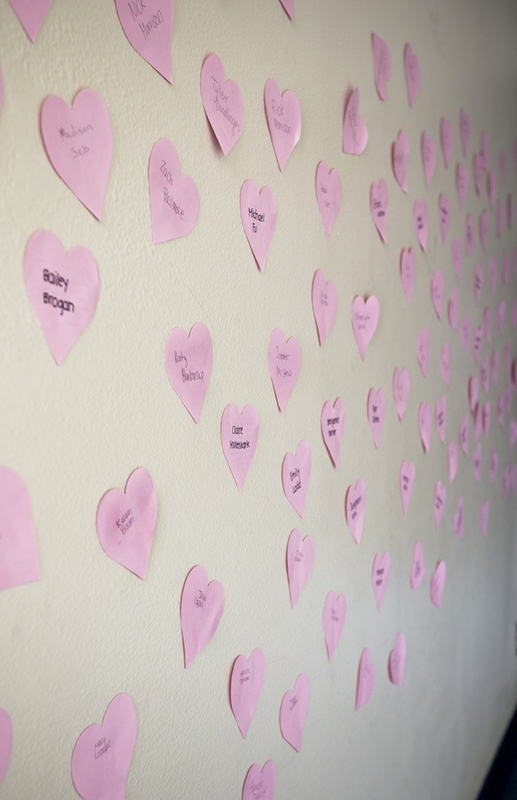 For more photos, visit Getting the feel for J-high and Elementary Valentines. 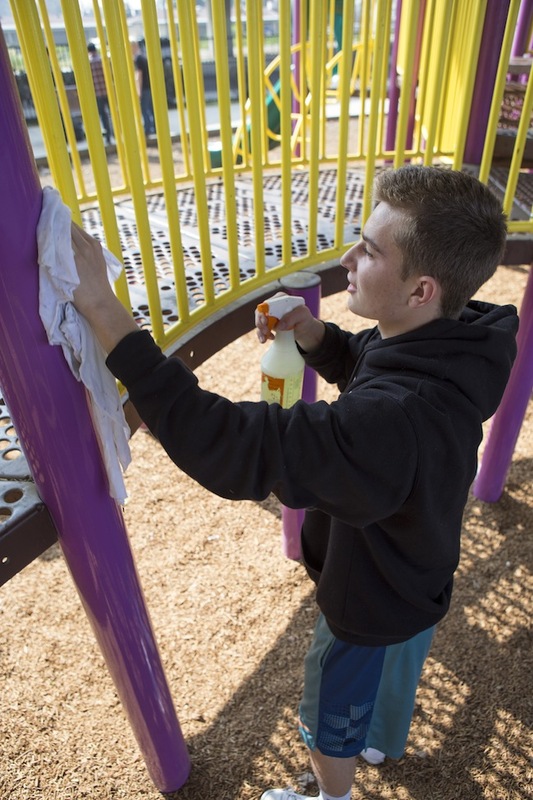 Tyler Breedlove, ’16, sprays and wipes down the Ted C Wills Community Park Playground, Feb. 19. The second annual FC Serve Day was a success; we covered nine different locations all over Fresno. Jared Kaiser’s serve group sanitized, picked up trash and swept, making the park beautiful for many to enjoy. For more photos, visit Graffiti clean up and Neighborhood Thrift. 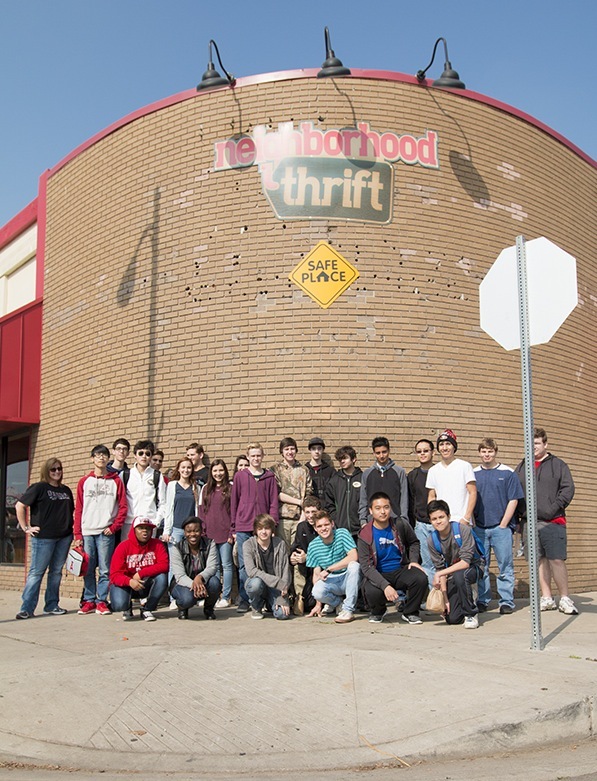 In the second annual FC Serve day, a group of FC Students helped out at Neighborhood Thrift. The Neighborhood Thrift team helped the community by passing out flyers that gave them 15% off their next purchase and information about the store. For more photos, visit Graffiti clean up and Class sign-ups. 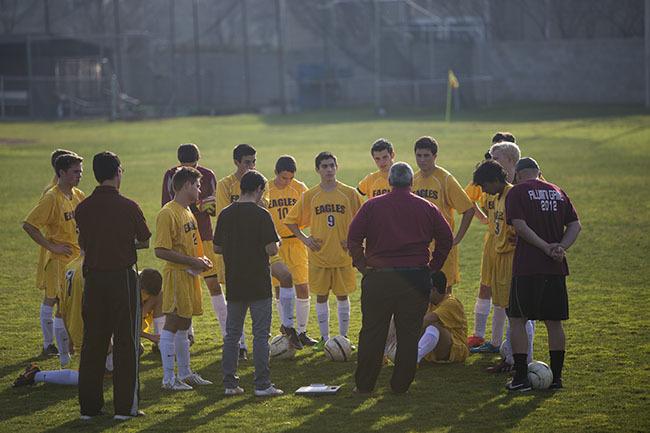 The boys varsity soccer team is in the Division 6 playoffs. Their first game is against Orange Cove today 6:30 p.m., Feb. 18. 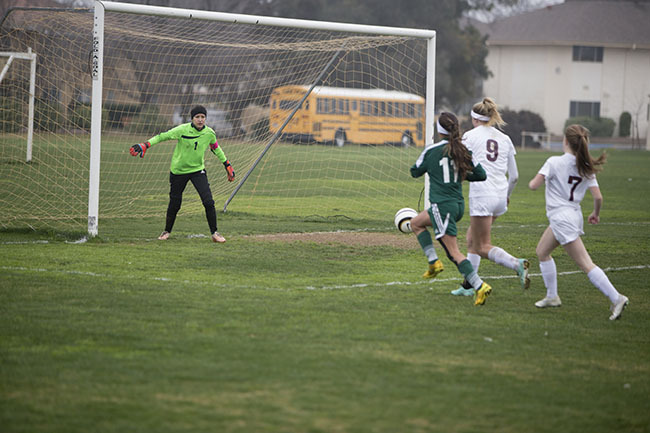 The varsity girls soccer team won their first playoff game against Firebaugh, 3-0, Feb. 17. They are moving on to the next round, their opponent is TBA. For more photos, visit Elementary square dancing and Soccer playoffs. HS leadership does their best to encourage students and make them feel appreciated; writing every student personalized notes for Valentine’s Day, Feb. 13. During passing period you can walk downstairs and grab your name on the wall. For more photos, visit God Bless America and Val-entines day. 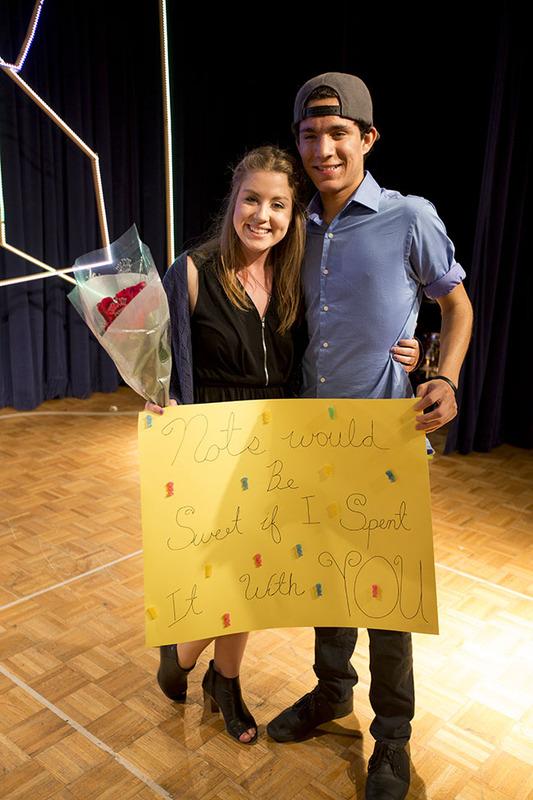 Rick Morrison, ’15, right, creatively asked Clare Kollenkark,’16, to Night of the Stars (NOTS), Feb. 12. In the months leading up to NOTS high school boys feel the pressure to ask girls in creative ways. In the past years boys have made signs and bought flowers; Morrison however added his own creative touch. His grand idea was to line the walkway leading to ground zero with soccer balls, and let her walk into her big surprise. Kollenkark was lead into a dark room and their favorite song began to play, Thinking out Loud, by Ed Sheeren. Morrison was on the stage waiting for her and they danced. Once the song was over he brought out a sign and popped the question. We are sure to see more creative attempts in the coming weeks ahead. For more photos, visit Love notes and Val-entines day. Morgan Miller, ’16, begins her Econ test during 6th period; very quickly she finds that it was going to be a long one, Feb. 12. Robert Foshee tests his Economics class on the demand schedule and demand curve. 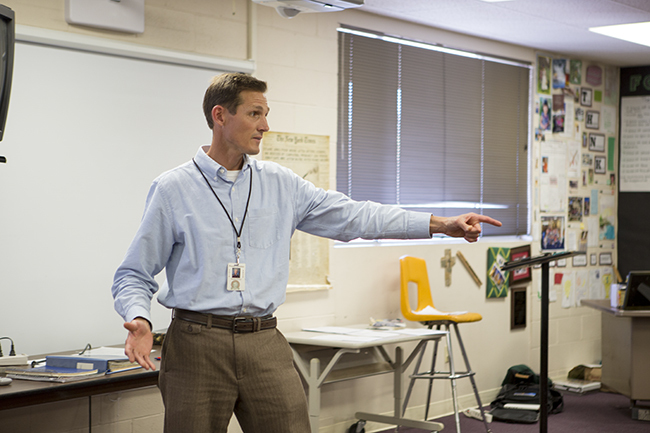 Aside from teaching Economics, Foshee also teaches Civics, Christian living and leadership. For more photos, visit Student spotlight and Serve Fresno. 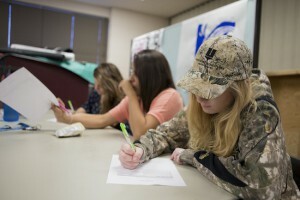 This weeks Student Spotlight is Brooklynn Rose Barth, Feb. 12. Barth is a junior, and a dedicated student; who also is on the FC varsity cheer team. 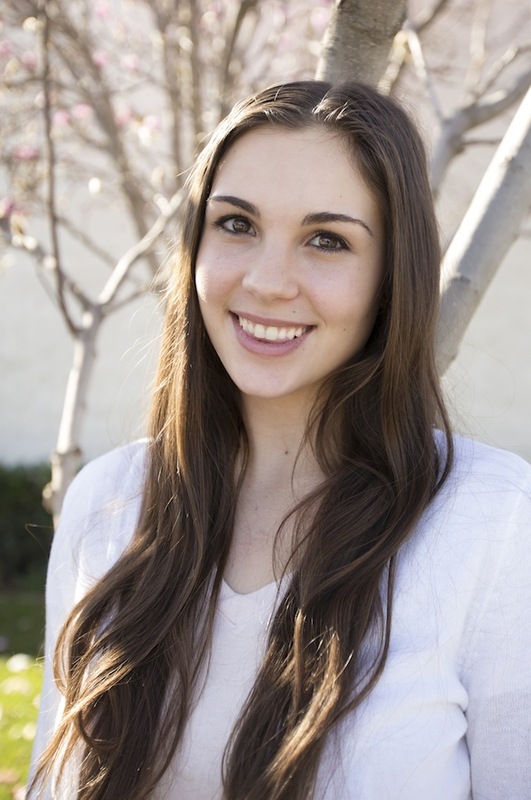 After graduating from FC she plans to go to college in California and study child development or child education. It will also be Brooklynn’s seventeenth birthday this Saturday, Feb. 14. FC is full of different students and stories, Student Spotlight is one way we can get to know each of them a little better. For more photos, visit Into the looking glass and Serve Fresno. 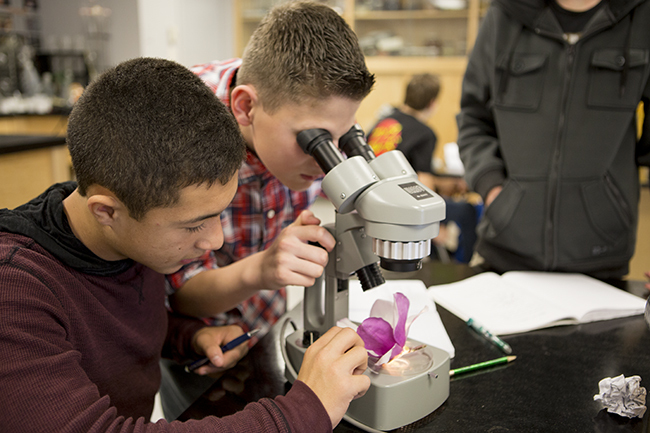 Tyler Villines, ’18, left, and Jaden Ventura, ’18, investigate how meiosis works in flowers, Feb. 11. 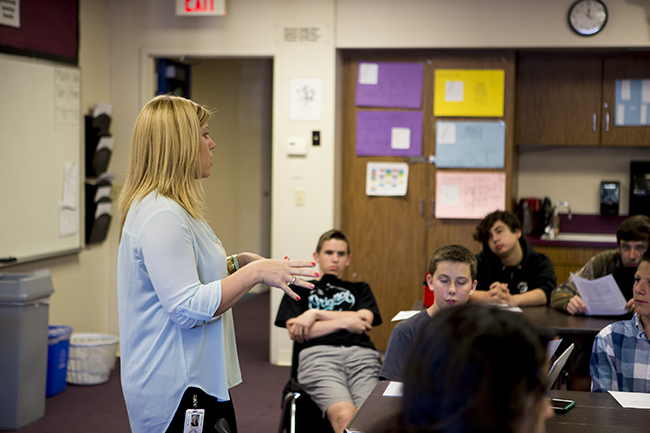 In Karen Walter’s 3rd period biology class, students learn how meiosis is the reproductive system in plants. Students use microscopes to inspect the reproductive parts of the plants. For more photos, visit FC serves 2015 and Cheeky children. Seniors Toby Pan and Michael Fu interviewed Artist Arminee Shishmanian about her bronze sculptures on display at the Fresno Art Museum. Look for an upcoming article by seniors Toby Pan and Michael Fu on the art show by Shishmanian. For more photos, visit Grand old flag and Hope Fresno panel. No. 9 Olivia Messer, ’18, tries to get the ball back against Riverdale the last time they played them, the final score was a win for the Eagles, 2-1. The girls soccer team plays at Riverdale at 3 p.m. and the boys soccer team plays at 6 p.m.
For more photos, visit Kindness month and Hope Fresno. A diverse panel of speakers gathered together to speak at Hope Fresno. This new was an event was held at The Well Community Church, Feb. 7. A group of panelist, left to right, Brad Bell, Pastor DJ Criner, Sabrina Kelley, Bryson White and Pastor Paul Binion spoke on how racial inequality is in our country and our community. This was a chance for leaders in the African American community to give incite into their view of issues that are happening around the country. For more photos, visit Happy Birthday! and Basketball games tonight. 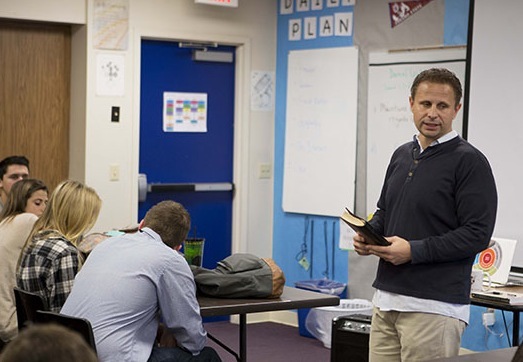 The Well North Campus Pastor, Chris Schultz, spoke in Robert Foshee’s 1st period Christian living class, Feb. 6. 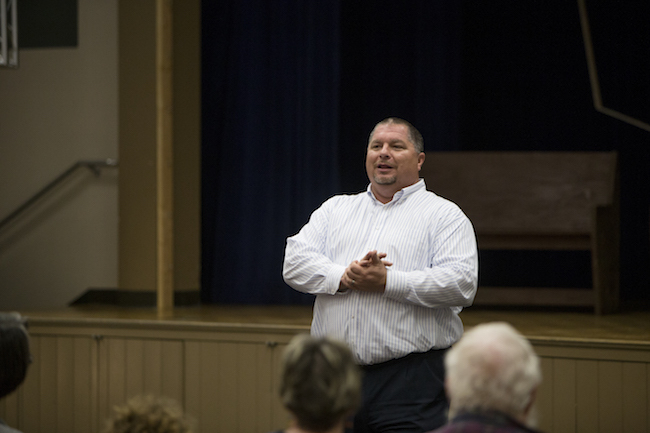 Schultz talked about, Hope Fresno, an event that is happening at The Well North Campus, Feb. 6, at 6 p.m. and Feb. 7, at 9 a.m. 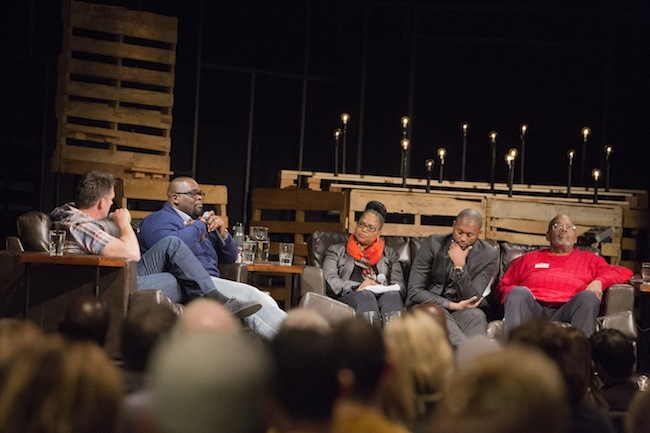 The Well is inviting Pastor DJ Criner, Pastor Paul Binion, Pastor Brad Bell and Sabrina Kelley to speak on how the African America community feels about how racial injustice is affecting our country. For more photos, visit Kindness month and Honor choir. 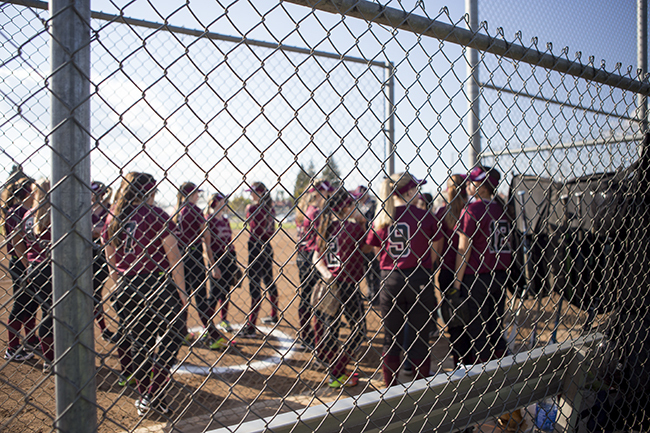 As softball season approaches, our FC field is in need of some maintenance, Feb. 6. 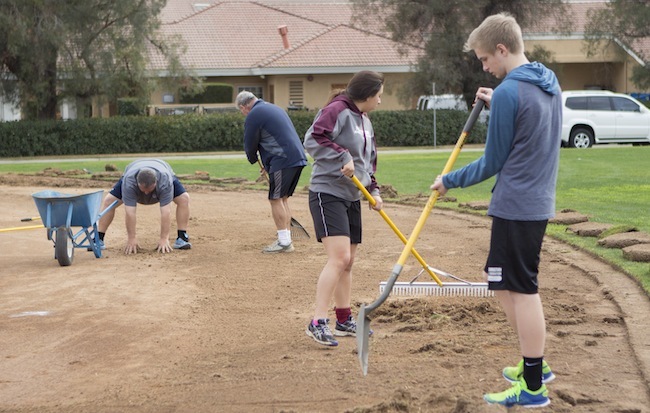 Gaby Siqueiros, ’15, middle, and Roman Endicott, ’18, right, work on leveling the softball field. The lip on the grass was causing ground balls to pop up because is was four inches higher than the infield dirt. 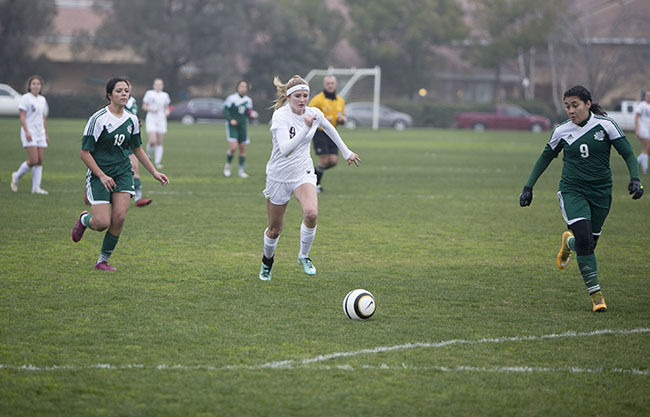 For more photos, visit Soccer at Parlier and Basketball looks for their spot in play off’s. 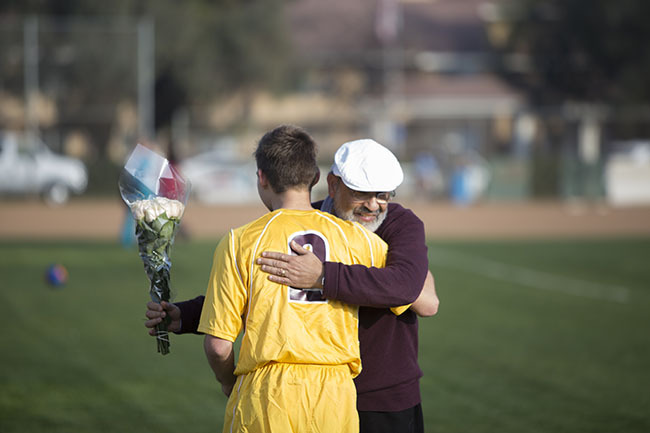 Adam Khouzam, ’15, embraces his father with a hug before his final home game. 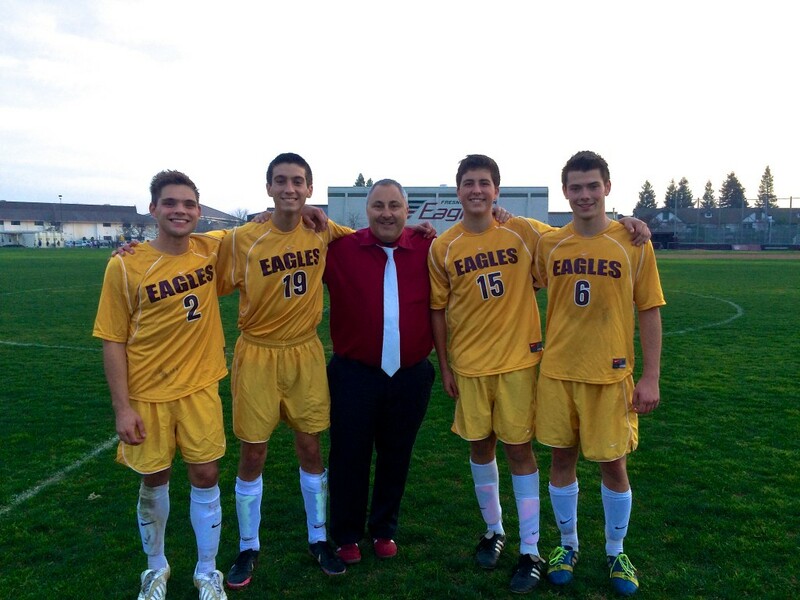 Four varsity seniors played their last home game, Feb. 3. These valuable assets and good friends will finish their last season in the up coming weeks. 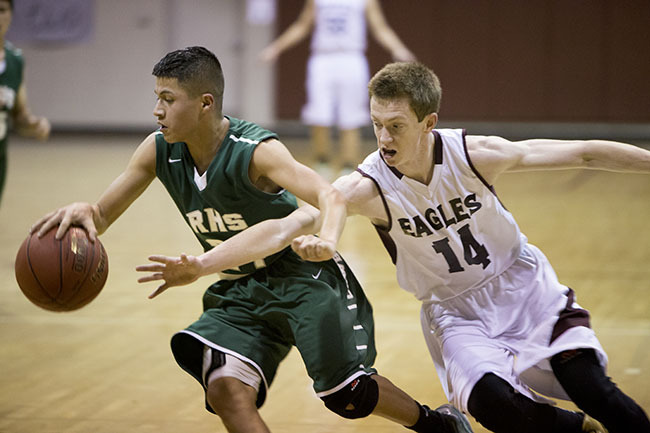 Eagles next game is against Parlier High School at Parlier, 5:30 p.m., Feb. 6. For more photos, visit Candy gram sales and CIA reports. Toryn Triplett, ’20, makes her potholder with a cross stitch pattern in Sharon Scharf’s Home E.C. class, Feb. 3. The Home E.C. 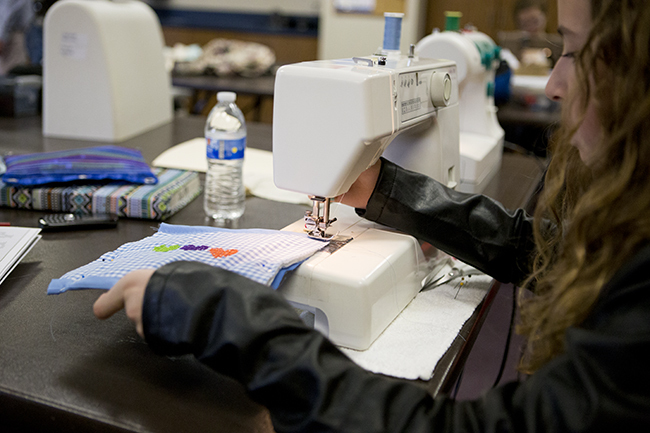 students learn to make a variety of cross stitch patterns. They also make pajama bottoms and or a t-shirt. For more photos, visit Jonas Anderson and Basketball senior night. 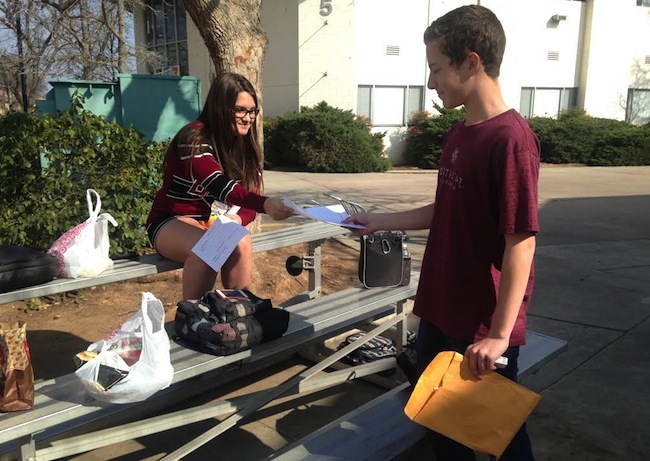 Wes Hinton , ’20, walks around during lunch time selling candy grams, and sold one to Lauren Tucker, ’18, Feb. 4. Candy Grams are a dollar, and are sold through JH leadership. Everyday at lunch a student will be walking around until Thursday, Feb. 12. For more photos, visit Cross stitch pot holders and CIA reports. 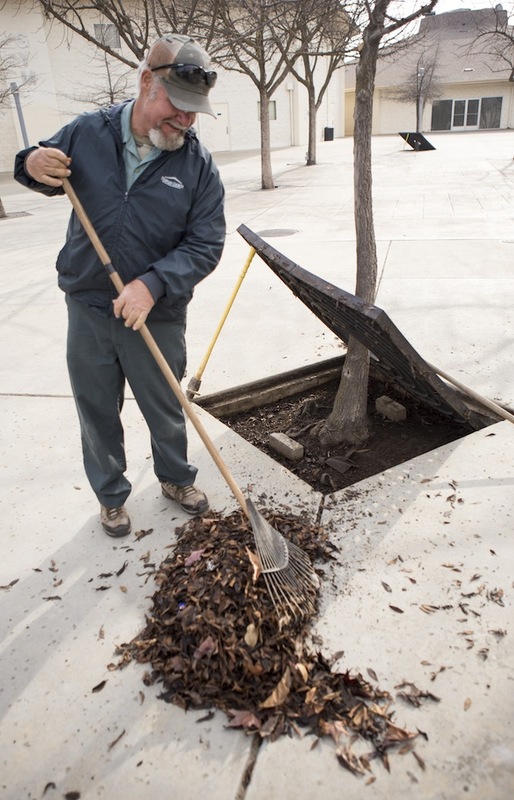 Peoples Church Grounds Keeper, Dan Baker, racks the wet leaves out from under the tree grates, Feb. 4. While walking around campus, if you see any of the hard working employes be sure to thank them with an encouraging word. For more photos, visit Ninja moves and Eager to learn. The last soccer home game was a success with the boys winning 4-1 against Minarets HS, Feb. 3. It was a special senior night as the whole team suited up in their throwback yellow jerseys. For four players on the team this was their last home game, Taylor Howard, Jordan Castro, Nick Fontes and Adam Khouzam each had an exciting and victorious last home game. For more photos, visit Leave clean out and Eager to learn. Throughout the course of the last few weeks, FC staff and administration have been working together to create additional academic support for at risk students grades 7-12. Each Tuesday in Advisory, students, 7-12, complete an Academic Progress Check. For more information or questions contact Director of Academics, Michael Fenton. For more photos, visit Senior night and Black out. No. 3 Chris Grossman, ’15, shoots for three against Riverdale High School. 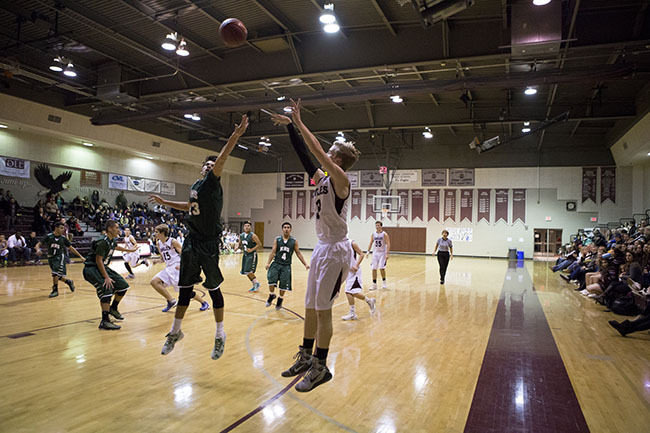 The varsity team plays Minarets High School at 7:30 p.m. in the FC gym, Feb. 3. Senior night will be a black out for the student section in celebration of the last home game. The Basketball team is 2-3 in league and is looking to even the score tonight with a win. For more photos, visit Senior night and Sophomore’s take home the win. No. 9 Olivia Messer, ’16, charges the goal after a breakaway against Riverdale High School, Jan. 29. 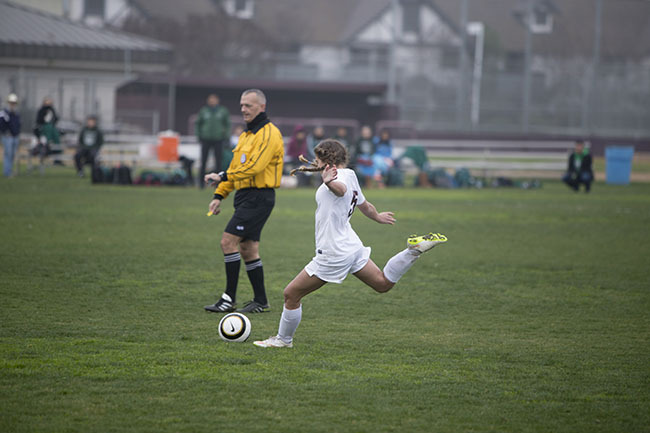 The girls varsity soccer team is playing Minarets High School today on the FC field, Feb. 2. It is the last home game of the season and also senior night. The coaches will be honoring the seniors at the beginning of the game. For more photos, visit Groundhog Day and Super Bowl XLIX. No. 14 Aaron DeWolf, ’15, tries to steal the ball back after Riverdale High School inbounded the ball. The basketball teams play Fowler High School at home, Jan. 30. The J.V. team plays at 4:30 p.m., the girls play at 6 p.m. and the varsity team plays at 7:30 p.m.
For more photos, visit Worship time and Practice AP U.S. test. This week’s throwback is Kindergarten Teacher Amy Witters class of ’73. 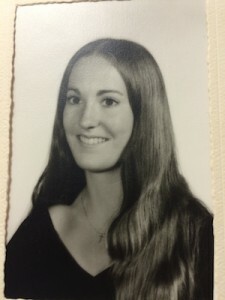 This week’s throwback is Kindergarten Teacher Amy Witters class of ’73. Witters has been teaching the campus kindergarteners for 21 years. For more photos, visit Photosynthesis and Friday rally. 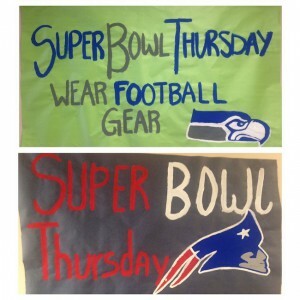 Students, don’t forget to dress up and support the team you want to win the Superbowl Thursday, Jan. 28. The biggest football game of the year is almost here, and FC is celebrating by hosting a competition: whichever class has the most students dress out for their team will get bonus points in the rally. 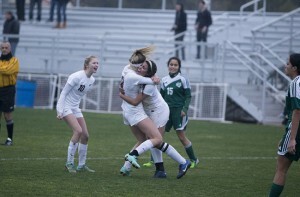 The girls soccer team won in overtime versus Riverdale High School, 3-2, Jan. 23. Olivia Messer, No. 9, ’16, scored the final goal in overtime to win the game against the Cowboys. The girls next game is at the Folwer High School stadium against Fowler, Jan. 29. For more photos, visit Peach Blossom and Rain in the valley.